Kodak ESP Office 6150 is an All-in-One (print, copy and fax) printer that also has an 802.11 n Wi-Fi connection plus an Ethernet port (10 Mbps). 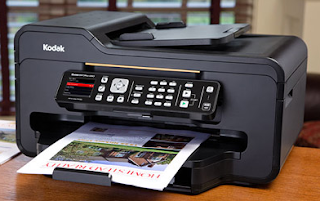 The most interesting thing here is the convenience offered by this printer to print photos directly from your phone (iPhone and Blackberry) to the printer using a Wi-Fi connection directly without using a wireless router (probably already using Wi-Fi Direct technology). By downloading Kodak Print App (for Blackberry) or Kodak Pic Flick App (for iPhone) app, we can print wirelessly later. Another advantage, as a printer that uses this ink cartridge, Kodak claims that this ESP 6150 printer has the cheapest ink cartridge compared to similar printers although the difference is not far away anyway.